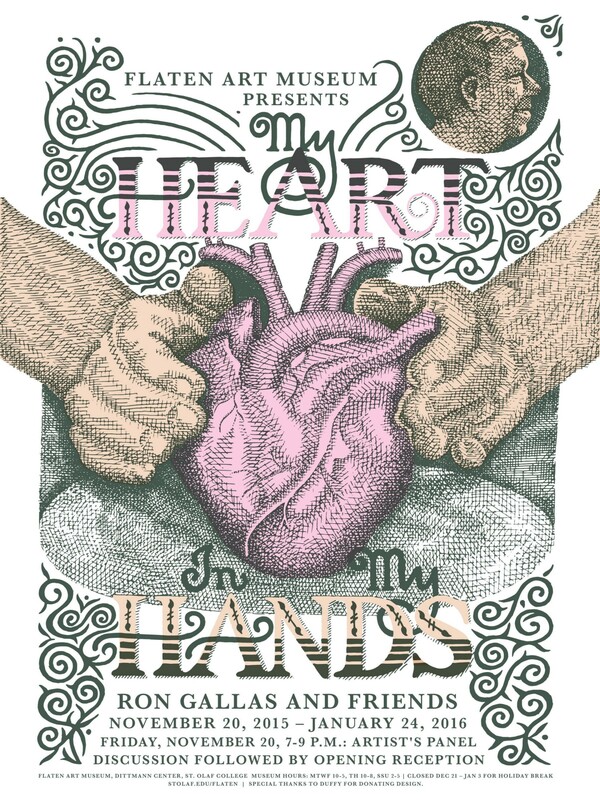 My Heart in My Hands: Ron Gallas and Friends celebrates the artistic career, creative influences, and upcoming retirement of Ron Gallas, Associate Professor of Art at St. Olaf College. Placing Gallas’ work in proximity to the work of artists who have influenced and been influenced by him, this show examines the interplay between artist and creative community. Featuring new work by Gallas alongside Sam Chung, Michel L. Conroy, Jill Crosson, Paul Dresang, Joe Duffy, Peter Eide, Curtis Hoard, Randy R Johnston, Warren MacKenzie, Billy Mayer, Justina Ny, Judy Onofrio, Monica Rudquist, Mark Pharis, James L. Tanner, Janice D. Tanner, and Nancy Vaughn. Ron Gallas earned his B.A. from the College of St. Thomas in St. Paul, Minnesota, and his M.F.A. in ceramics from the University of Minnesota. He has received numerous grants and fellowships and conducted regional, national, and international exhibitions, lectures, and workshops. Gallas’ teaching assignments have included Pennsylvania State University, Macalester College, and St. Olaf College, where he has taught since 1987. The Ron Gallas Cup Library is a lending library of handmade ceramic objects. 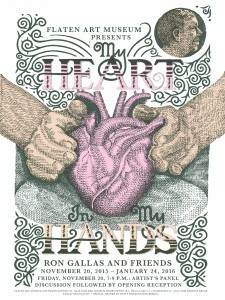 Launched trhough a CURI project in the summer of 2015, the cup library will open to the campus in conjunction with the exhibition opening of My Heart in My Hands: Ron Gallas and Friends in November 2015. Current students, faculty and staff may check out a cup for 7 days, and faculty/staff are eligible to check out a suite of cups for meetings. To reserve a suite of cups please contact Kate Fisher at cuplibrary@stolaf.edu. Extended museum hours for Christmas Festival (December 3-6, 2015): Friday 10am-8pm, Saturday 2-8pm, Sunday 12-5pm. Closed November 25 – 29; December 21, 2015 – January 3, 2016 for holiday breaks.